Today I read an interesting tidbit shared by a group of men surveyed on the topic of hair health. Of the 2000 men surveyed, many of them agreed that eating a certain superfood food on a regular basis had a direct benefit on the health and luster of their hair. Once it became cool to post images of your curated breakfast social media, one option kept popping up in everyone's timeline. Soon, avocado toast became one of the trendiest foods in recent past. Years ago, avocado toast wasn't on anyone's radar. Now I can order it for breakfast at any of the little restaurants located in the hip parts of town. This surge of popularity meant that more people started to consume this healthy option on a regular basis. 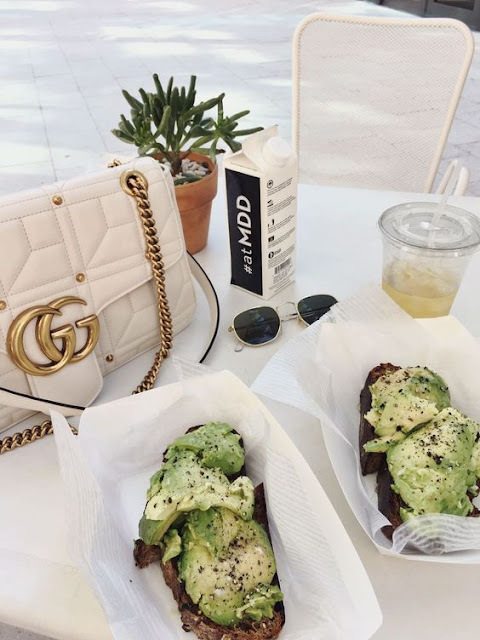 Since avocado toast is so easy to make at home, people began enjoying it quite frequently. As a result, some men began to notice an outward benefit to their hair. When I first heard the information, I wasn't very surprised. Avocados are loaded with healthy fats, vitamins A, B, C, E, K, folic acid and minerals. And if you pair it with toppings such as cayenne pepper, eggs, tomatoes, leafy greens, you've created powerhouse breakfast. Imagine the cumulative effects of swapping your typical breakfast of waffles or pancakes for a nutritious option like avocado laced with a little cayenne pepper (to boost circulation). That was my staple breakfast for a while and I was addicted. I've since wandered off and started choose less admirable options for breakfast. Thanks to these guys surveyed, I was reminded of my once beloved avocado toast. When fall and winter rolls around, I like to consume foods high in healthy fats to lubricate my skin, hair, joints from the inside out. Avocados are definitely going back into rotation. And not just internally. While researching for this post, I came across quite a few women sharing their testimonies of how well their hair responded to avocado deep conditioning treatments. I'm also stocking up on avocado oil so I can start lacing my shampoo with oil again. My hair loved oil cleansing and I"m sure it'll only get better with a hair healthy oil like avocado. my local coffeehouse makes an amazing green smoothie with avocado, spirulina, wheat grass, spinach, lemon, etc. The fats in the avocado make it a really smooth drink. sometimes i add cayenne pepper to it too. you should try to make a home-made version (still working on mine) but its very delicious and healthy! I love avocado smoothies! I usually get them from local Vietnamese restaurants. So good but probably not as healthy as the one you get. That one sounds amazing.